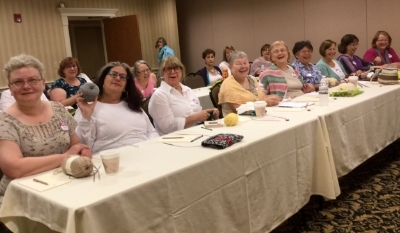 We had a wonderful time knitting and nattering in the heart of Amish Country this past weekend with guest teachers Carol Sulcoski and Franklin Habit. Friday evening, The Great Room at the Amish View Inn & Suites was a great big Knitting Circle! So many beautiful shawls and sweaters were being made and worn, it was dizzying! We got to know each other a little bit over cups of coffee and glasses of wine, and a good time was enjoyed by all! On Saturday we broke into two groups for Classes with Franklin and Carol. 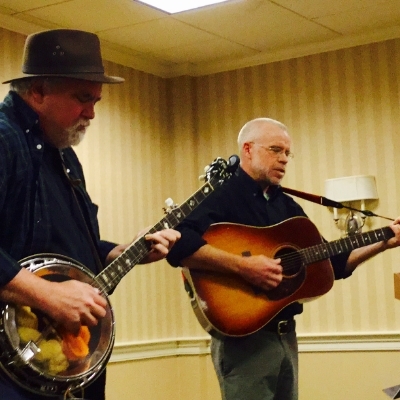 Saturday afternoon we had live music in the Great Room with a local, old-time band (featuring Bob from LYS!) The Knitpickers and time for a quick nip down to Kitchen Kettle Village and the Lancaster Yarn Shop! After a little rest, we enjoyed a banquet dinner (and more wine!) and Franklin Habit's presentation of his talk "B is for Purl: A Brief History of Knitting Patterns." Late night knitting ensued in the Great Room. Sunday morning featured a lazy start and then a Knitting Salon. We were serenaded by Cathleen Sauber, a knitting harpist while we knitted and visited. The Knitpickers (mini-version) came back and performed three special songs written just for the Lancaster Knitter's Retreat. Things wrapped up with an interesting, informative and personal talk with Carol and Franklin. They shared their favorite knitting book titles, their favorite tools, and cited their inspirations.